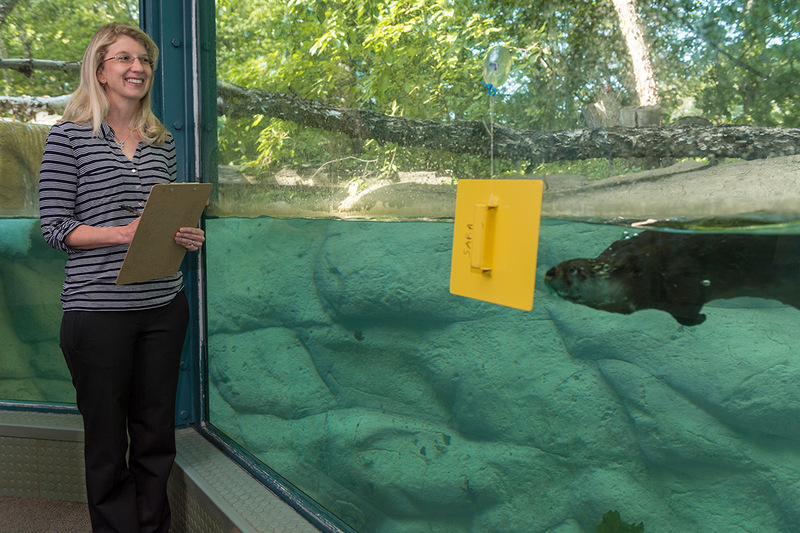 RIT Associate Professor Caroline DeLong conducting research with North American river otters at the Seneca Park Zoo. Research involving North American river otters based at Monroe County’s Seneca Park Zoo has concluded the fascinating animals can visually discriminate between two-dimensional objects and detect differences in shapes and colors. “That is a significant finding because otters may use visual object recognition to detect predators and prey,” said Caroline DeLong, an associate professor of psychology at Rochester Institute of Technology, who started doing otter research at the zoo in 2010. The research, which also proved the first preliminary behavioral evidence for color vision in North American river otters, was recently published in the journal Learning and Behavior and a short video of the otters during their testing was produced by the BBC. DeLong said the research is helping otters survive in the future in nature. River otters practically disappeared from western New York for decades, as their habitat in and along the Genesee River had them clashing with predators, including humans hunting them for their fur. In the 1990s, the state Department of Environmental Conservation, with support from Seneca Park Zoo, captured them in the Adirondacks and repopulated them in western New York. The new research, which continues into 2019, is supported by a Summer Undergraduate Research Fellowship Grant to support student research from the Department of Psychology and the College of Liberal Arts. Catina Wright, the primary zoo keeper who cares for the otters at the zoo, was also instrumental in the research project by training the otters – named Heather and Sailor – to target on the stimuli, giving them gestures, talking to them and pointing to the place where the otters start the trials, and rewarding them by giving them a fish when they succeed. The study was supported by grants from the River Otter Alliance Foundation and the Milwaukee branch of the American Association of Zookeepers, as well as support from RIT’s College of Liberal Arts and its Department of Psychology. RIT graduate students Irene Fobe ’17 (experimental psychology), Kenneth Tyler Wilcox ’13, ’17 (psychology, applied statistics) and Evan Morrison, who expects to graduate this spring with a degree in experimental psychology, also participated in the research, as well as numerous undergraduate students from DeLong’s Comparative Cognition and Perception Lab who assisted in running the research sessions.